WASHINGTON, D.C., December 1, 2003 –With a focus on fighting one of the world’s deadliest diseases, 36 Peace Corps volunteers completed their training and were sworn-in on November 26, 2003, to begin working in HIV/AIDS awareness and education projects in Swaziland. All 36 volunteers, who arrived in the Kingdom of Swaziland on September 17th, were sworn-in by the U.S. Ambassador James McGee. The ceremony marks the return of Peace Corps programs to Swaziland. His Royal Highness Prince David (representing the King), the Director of the National Emergency Response Committee on HIV/AIDS (NERCHA), and representatives from other HIV/AIDS organizations also attended the ceremony at Esibayeni Lodge. Currently, the greatest problem confronting the people of Swaziland is the HIV/AIDS pandemic. In 2002, the HIV/AIDS infection rate of adults (ages 15 to 49) was 33.4 percent, and approximately 35,000 children have been orphaned as a result of AIDS. The Peace Corps volunteers are all HIV/AIDS educators and will assist the Swaziland government in implementing its HIV/AIDS national strategy. In collaboration with NERCHA, the Deputy Prime Minister’s Office, the Ministry of Education, the Ministry of Health and Social Welfare, and other partners, Peace Corps volunteer activities will focus on training teachers and community members in life skills aimed at HIV/AIDS prevention; initiating and promoting programs in HIV/AIDS awareness; identifying partnerships and resources alliances to fight the epidemic; strengthening existing HIV/AIDS intervention strategies and activities; mobilizing communities to respond to the effects of HIV/AIDS; and working with in-school and out-of-school youth and with orphans. This first group of volunteers will serve in the Southern and Eastern regions of Swaziland. 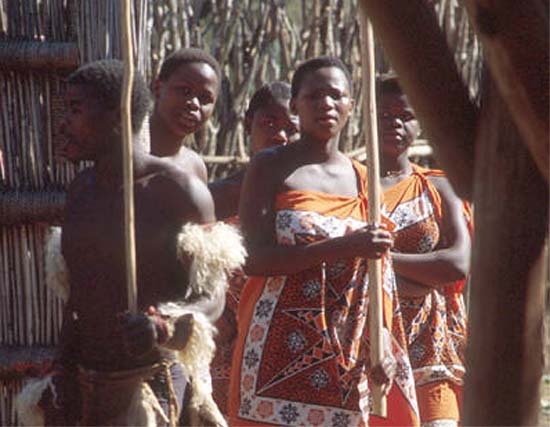 Swaziland is an African nation the size of New Jersey located between Mozambique and South Africa. The Peace Corps first arrived in Swaziland within a year of its independence from Great Britain. From 1968 to December 1996, more than 1,185 Peace Corps volunteers served in Swaziland, most in the fields of agriculture or education. With an average population of one million in Swaziland and an average of 200 people taught per Peace Corps volunteer, it is estimated that one-quarter of all Swazi people have been affected by a Peace Corps volunteer.